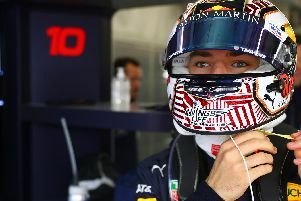 Max Verstappen has asked why he was the only driver to get punished for 'exceeding track limits' after he was handed a five-second penalty after the race, costing him a spot on the podium. The Dutchman raced supremely around the Circuit of the Americas, battling from 16th on the grid to be in contention with the front runners. And after a last ditch move on the last lap to pass Ferrari's Kimi Raikkonen, which saw him mount the kerbs at Turn 17, the Red Bull racer felt he'd snatched the final podium place. But while he was awaiting his trophy, he was handed a five-second penalty, promoting Raikkonen back to third. There were several incidents throughout the race which saw drivers exceeding track limits and driving beyond the white lines, but Verstappen was the only driver to be punished, promoting the 20-year-old to question why. He said: "I got a five second penalty and one penalty point for what? I ran wide on a track with no limits that everyone is running wide on all weekend, why do I get punished? The rule is we cannot protest so all we can do is move on to Mexico, weird rule. Verstappen's Red Bull team-mate Daniel Ricciardo, right, battled with Mercedes driver Valtteri Bottas, left, which saw the Finn exceed track limits without punishment earlier in the race. "We have an amazing race with loads of overtakes and action and then due to 5cm or 10cm of kerb the result is changed, people don’t like to watch that. "I am feeling good after the race but of course it is never nice to be about to step out onto the podium and then have it taken away. They should at least let us talk it through in the stewards’ room first and voice our opinions. "I had a great race and I am happy with fourth but it’s the way I got there that hurts."